TOFU. MOFU. BOFU. Inbound campaigns. Conversion assets. There’s a whole bank of vocabulary that comes with a content marketing strategy, and not all of it’s familiar even to dyed-in-the-wool marketeers. But all types of content marketing are pretty straightforward when you understand the purpose behind them. It’s more about pull than push. Traditional advertising is push media. Hard-sell sales messages all up in your face. There’s nothing wrong with that (even the best content marketing agencies do it). But modern multi-channel agencies balance it up with the other end of the stick: creating pull, to attract customers towards us. It’s the other half of true engagement. In our last piece, we looked at how to overcome internal villainy to get the most out of your content marketing brief. In this fourth part of Stripped Bare, you’ll see the reasoning behind the acronyms and initialisms of content marketing — what they are, and why they exist. Let’s get started! Let’s start with an easy one: everyone knows what a sales funnel is (or they can figure it out pretty quick). A large or broad audience goes in the top. Through various stages that audience narrows to those with a realistic prospect of becoming customers. At crunch time, a small number of confirmed customers will drop out the bottom. In content marketing, the funnel’s more about pull-through than push-in. Content that is created with real purpose will attract the prospect, separating out qualifiable leads from those not ready to continue the buying journey yet. And without alienating those who need more space. Here’s a run-down of the different types of content we create to engage them. We’re suckers for a good acronym (and we’re pretty fond of initialisms too). From TOFU, MOFU and BOFU to MQL, SQL and SAL. Get to grips with our jargon buster — aka TP WOW (Tomorrow People’s words of wisdom). TOFU: Top of the funnel content. Think articles, infographics, slideshares. This content is designed to attract a large audience, and address a specific pain point, question or challenge. Consideration / conversion = An in-depth piece of content that is essential for capturing data at the point of download. It’ll be targeting a prospect looking for a solution to their pain. MOFU: Middle of the funnel content. The objective of MOFU content is to educate leads that are not yet fully qualified. BOFU: Bottom of the funnel content. This is copy to go in for the sale and engage a lead in one-on-one dialogue offering discounts, consultations or other services. Campaign in a box :A campaign format that can consist of varying elements; designed so that it can be easily rolled out across multiple verticals, horizontals... you name it. MQL = Marketing qualified lead. MAL = Marketing accepted lead. SQL = Sales qualified lead. SAL = Sales accepted lead. DPS = Double page spread. 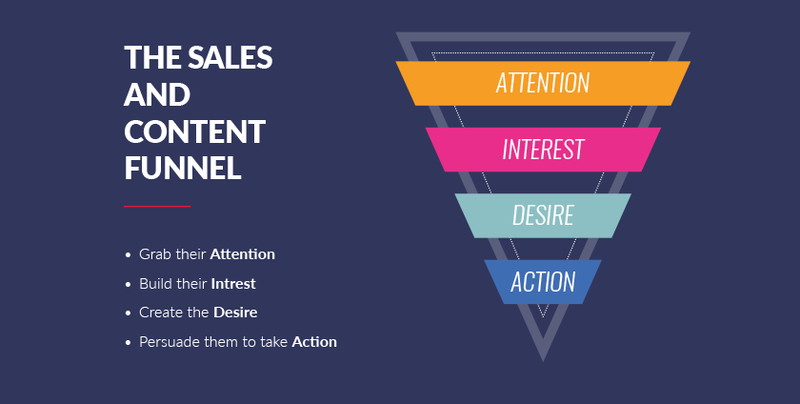 At the widest part of the content marketing funnel is TOFU (top of the funnel content). This is content that appeals to a broad universe of prospects — everyone with the business pain your product or service solves. Essentially, TOFU is designed to create as much awareness as possible. Think of this as flirty texting. Types of content here include: thought leadership blogs, infographics, articles, and SlideShares. Content will address the pain points and objectives but be centered around the big themes. So what are great themes for TOFUs? Well, what makes BuzzFeed and Mashable so successful? 5 Ways to Do This; 3 Things to Remember When You Do That. We’re casting a broad net, so don’t worry if it seems to appeal to an audience wider than you expected. You’re building goodwill and making friends — early. The goal of consideration content is to make prospects super interested in you. Think of this as a first date. This is where the prospect will convert on a landing page. Content types we will use here: playbooks, webinars. Content here will talk about objectives and pain points in detail and showcase your understanding. When your prospect has been interested by a helping or two of TOFU, they’ll be directed towards consideration content to convert. The audience is tightening at this point: they’re people with a genuine business pain and actively interested in ways of solving it. The content here is building interest in you as the solution. You know they’re interested, but you need to show some more love to really create the desire. MOFU content is the second date. Content types used here include: videos, eGuides, and one-sheets. Content here will show you’re the know-it-all. You’ve got the solution they need. While consideration content creates interest, MOFU creates the desire by getting a bit dirtier with solutions. It may talk about outcomes of applying a certain new methodology, or introduce how you solve a pain with a specific methodology, to get them thinking about approaches that may be new to them. It’ll often use a left-field idea or provide a refreshing angle on the problem. One that captures their attention and sticks in their minds. Remember, this isn’t hard-sell; it’s persistent pull. The decision to continue on the customer journey must be theirs. All MOFU does is make it easier. Go on, close the deal. You’ve got this. BOFU content tends to come in the form of case studies, audits, calculators, and sales sheets. Content here will show your service offering is the right choice; using evidence-based content to justify its value. BOFU is the deep shale, denser content for prospects with a realistic chance of becoming paying customers in the near future. These are people prepared to make an investment of time in finding out whether your product or service is right for them. Now you’ve got their attention, make sure what you give them is worthwhile. The bottom of the funnel is where prospects are ready to pick up the phone or drop you an email — i.e. become a qualified lead across your sales desks. TOFU, Consideration, MOFU, and BOFU have attracted them into your orbit and they’re ready to start a relationship. Not realizing that the “relationship” actually started some time back, with the first TOFU they consumed. You may not have realized it yet, but this sequence of TOFU, Consideration, MOFU, and BOFU has a name: inbound marketing. Clients who understand it tend to enjoy the best relationships with their agency, and get the best work out of them too! The success of inbound marketing and content marketing is rooted in buyer psychology. Whether B2B or B2C (or even C2C), people sense the sizzle before the steak. They see the shine before the design. It’s why an experienced realtor can tell within a minute if a homebuyer is interested, and why car manufacturers obsess over shades of black and the clunk of a door. People engage emotionally first, by instinct and gut feel. Heart over head. So that’s what we marketers must appeal to — their senses. Often their sense of fun. That’s what can make an audience warm to you. Before they even know who you are. You’ve caught their attention with something appealing. And that means far more of the cold suspects will become hotter as they progress down the funnel. Remember, overall conversion rate is a function of lots of stage conversion rates, at each level of the sales funnel. And you want to keep as many realistic prospects as possible in the game. Some clients — the kind that aren’t right for an inbound content marketing agency — want the wham-bam all up front. Hard-sell from Day Zero. But that doesn’t work. Sales is a process, and we want the people that start it to stay the course. That’s content marketing. Of course, attraction isn’t all one-way. Keeping prospects on track means not losing them in the flood of other enticing marketing out there. Without yelling in their faces. Derivative content is more like signposting, providing prospects with mile markers to make sure they don’t wander off. Think landing pages that funnel content may link to. Emails that are pushed out. And of course social posts. So when we talk about derivatives, we’re talking the seasoning that goes with the content (but it’s mostly emails, landing pages, and social copy). Well that was simple, wasn’t it? Epic content marketing doesn’t have to be complicated — when you know what works. With these main bits of terminology defined, you’re in a great position to get the most out of your content marketing agency. Now you can talk the talk of agency lingo, join the industry conversations and learn how to do content marketing from the best in the business. Download: Content Marketing in the UK 2018: Benchmarks, budgets, and trends.